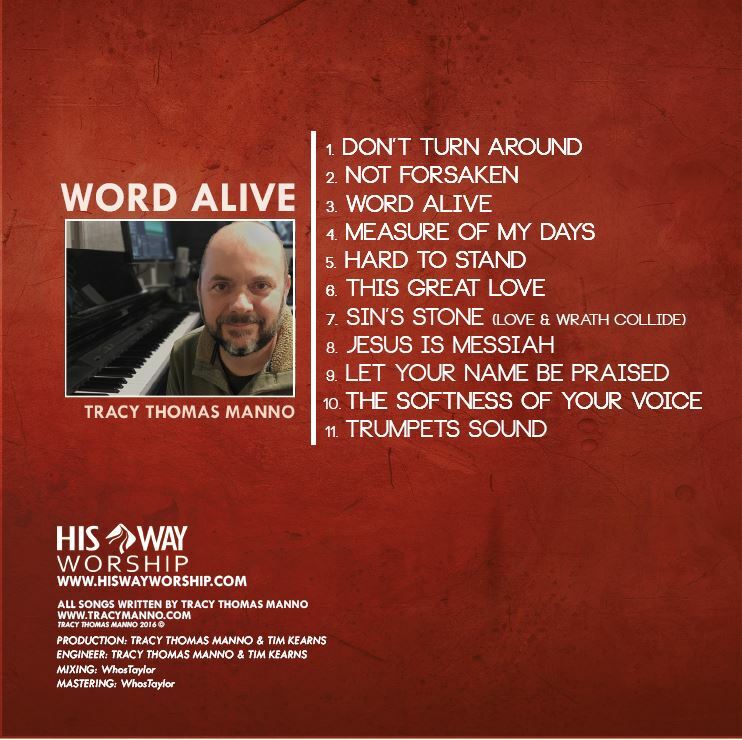 Word Alive is a collection of honest experiences set to song as an offering of worship. It is through the process of daily life that God, enduring our frailty, stubbornness and selfishness, does His most gracious work of transforming us into the likeness of His precious son, Jesus. This album reflects His enduring work within us, as we continually offer our lives as a living sacrifice. As new creations in Christ we desire to live godly lives, but we continue to contend with our fallen nature. Though we desire what is righteous our deceitful hearts and corrupt flesh are always there to do what is evil. As written in Psalm 37 we are encouraged to continue even though we may fall, for our God is faithful and He will not forsake those who delight in His ways. 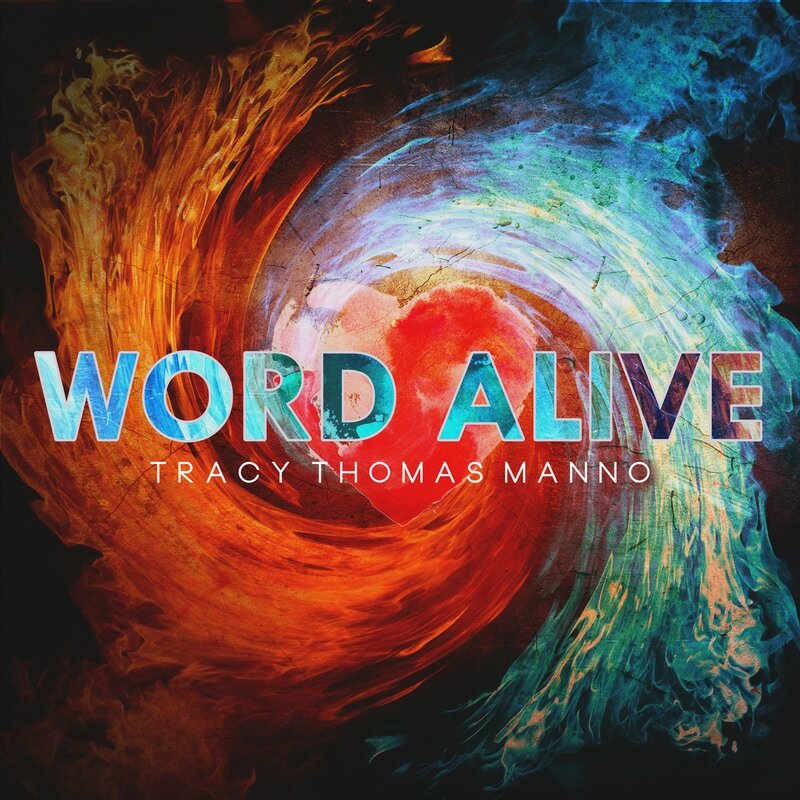 “Word Alive” speaks to the newness of life available to the believer. The Christian life is not just to know more about the Word of God, but it is to reflect those truths in our lives as living, as trusted promises to walk in, as recipients of salvation whose lives are being transformed and redeemed day by day. The Word of God is our present reality as much as is the world around us. Jesus Christ was and is the embodiment of God's Word, the Word in human flesh, and He gives us His Spirit, that same Spirit of prophecy, His very word, to be active and living inside each of those who believe, declaring in every moment the truth of who we are and what we have in Christ, if only we would take the time to listen and have the faith to believe. (VERSE 1) The Word He put on flesh, the power of God in humbleness. And from His fullness He, has made the Father known to me. And onto me he showers, the same eternal power, that saved my life from sin, set free to live for Him. (CHORUS) Word Alive, to life you’re calling. Word of God, I see you working deep inside of me, where you’re declaring who I am to be. Know my thoughts and see right through me. Draw me near your throne where I find mercy in my need. You’re the Word of Alive, the Word alive inside of me. (VERSE 2) Much more than what I’ve known, your living Word in me controls. All things to be restored, to build my faith and open doors. You tell me what I have, in Christ my needs are met. Your faithfulness will prove, a finished work for you. (BRIDGE) From within my soul I will bless your holy name. For written on my heart are the truths that I proclaim. I will fix my eyes on the lamp that lights my way. As your promises assure, guard my life according to your word. Drawing on truths found in the book of Ephesians, “Hard to Stand” explores the honest struggle between our own weakness, fears and intimidations, versus our sincere desire to walk in faith and stand for truth. (Verse1) You bore witness to my Spirit, of the truth that I once mocked. You opened up my vision, so I could focus on the cross. You looked beyond all my offenses, and at my shame you did not scoff. Instead you drew me with your kindness, You put repentance in my heart. (Chorus) Now I know of your undeserved mercy. Even I was a stranger to the cross. And though I've spit in your eye, Jesus saw me as a prize. Help me share from my heart, this great love. (Verse 2) So turn my anger into caring, for I was also in the dark. May I see the souls of others, before condemning with my thoughts. (Chorus 2) For I know of your undeserved mercy. Even I was a stranger to the cross. And though they spit in your eye, Jesus sees them as a prize. Help me share from my heart, this great love. (Bridge) Let my eyes look beyond their offenses. At their shame help my pride not to scoff. But use my life to draw them through your kindness. Put repentance in their hearts. (Verse 3) We know this world it is passing, to be replaced with everlasting. My life’s cares and all the petty complications matter not when I see them through salvation. (Chorus 3) For I know of your undeserved mercy. Even I was a stranger to the cross. And though we’ve spit in your eye, Jesus sees us as His bride. Help me share from my heart, this great love. Help me share from my heart your great love. A question is often asked, if God is so loving how could he pour out wrath on those He claims to love, and not forgive them. Another question is also asked, that if God is so just, how can He forgive someone of sins they have committed and not punish them. Both questions have merit and speak to two clear attributes of God… the unfailing love He has for His creation, and His perfect justice which must rule the sinner guilty and sentence them to punishment. Both are true, and both must exist, yet how do they reconcile? The cross of Christ is where those two attributes collide, where both are powerfully demonstrated, and where two seemingly unbridgeable questions find one perfect, unimaginable answer. God himself is the just and the justifier. Because of His great love, God himself stands in our place, takes the legal sentencing of our sin, and executes judgment on our sin by pouring out His wrath upon himself. Justice is served, and as a result forgiveness is offered. Love and wrath they did collide, when my Lord was crucified. (VERSE 1) From the start there was an end, known before the world began. Before sin first cast its stone, Jesus chose to leave His throne. Greater love no man has seen, than Jesus weeping over me, knowing His own wrath would be, eternally poured out on me. (CHORUS) Once for all He took sins stone, unbound it's chains and called me home. Love and wrath they did collide, when my Lord was crucified. (VERSE 2) Who would know what would unfold, had it not been long foretold, that love alone would not withstand, the wrath of God that sin demands. Never could I have conceived, the plan He had to rescue me, the wrath of God poured out on Him, reveals the Fathers love toward man. (BRIDGE) Who could bear the weight of sin, the wrath and justice it demands. None but Jesus could withstand, the Lamb of God sent down to man. Mercy, grace I now receive, the King of Glory rescued me, from the power of the grave, into His presence I am saved. (ENDING) From the start there was an end, known before the world began. Before sin first cast its stone, Jesus chose to leave His throne. Love and wrath they did collide, when my Lord was crucified. "Jesus is Messiah" points to the truths found in Matthew 5, Mark 16, Matthew 24, 1 Thessalonians, and the book of Revelation. For all those who desire to live a godly life in Jesus Christ in the midst of increasing darkness, may these promises of our Lord encourage and strengthen us to persevere in truth and love. (VERSE 1) Lift your head, raise your hands, make a joyful noise. Praise the Lord, shout His name, stand and be a light. For a town on a hill cannot not be hidden. While its day we will tell of your saving grace. As the night closes in all the more proclaim. Our commission endures ‘til the end of the age. For the Glory of Your name. Your Truth I will proclaim. (CHORUS) Look around, hear the sound, there’s a thunder. Stand, hold your ground, truth will not be plundered. By the sword of His mouth every nation will bow. Every eye, every soul will witness, all deceit exposed in His presence, and all creation will sing to the Coming King, that Jesus is Messiah! (VERSE 2) So choose this day who you serve for the time is near. Those who trust in His word with a righteous fear, will not be ashamed when He rules and He reigns. Set your heart on the things of eternal life, for He comes at the trump like a thief in the night. Then all trials and cares will not be compared. To the Glory’s of Your Name. And the Truth’s that I proclaim. (BRIDGE) For the Glory of Your name. Your Truth I will proclaim. From before the world began. You declared Your perfect plan. “Let Your Name Be Praised” speaks to the believers’ conscious choice to make the sacrifice of praise to God in the midst of life’s darkest valleys. Filled with encouraging scriptures of hope and assurance, this song is a heart convicting, soul inspiring witness to God’s promises towards those that trust in His name. (CHORUS) Let your name be praised. Let your name be praised. In this heart I’ll say, Lord let your name be praised. (VERSE 1) Pressures mount my heart is hurting. Rest won’t come my soul is burdened. Tears run dry. Faith seems distant. Words are cheap and thoughts betraying. Wrestling old wounds that cling so fiercely. Still I know, my hope is certain. (VERSE 2) Disappointments and offenses. Discouragement and deep resentments. Fill my mind. They steal my healing. I start to see Your Word assuring, declaring that my victory’s certain. In my trials, you make me able. (BRIDGE) Though I struggle times and feel the pain, yet I know your goodness still remains, and I look up to the hills again, and I see my Lord at Your right hand. So I reach out from the dark once more, for I know my King, He will restore. Just as certain as the oceans roar, my salvations knocking at the door. And your promises, my precious gain, they were bought for me and still remain, so I call to you with Your own Word, with a joy this world has never heard. There is a common misnomer frequently used in Christian circles which says that God will not give us more than we can handle. The mistake is in the context of the scripture itself, as the apostle Paul is speaking about when we are tempted to sin, not about our trials and difficult circumstances. However in 2 Corinthians 1:8 he does speak about when our circumstances are more than we can handle, and how the purpose of those times are to make us press harder into Christ himself. To know the tenderness of His quiet voice, and to know that He has a perfect will for us in the midst of the circumstance is enough to quiet our anxious souls. Being removed from the circumstance is what we would desire, but God desires a greater work in us that can only be done through the circumstance. Knowing Him in the midst of the trial becomes the longing of our restless hearts. (VERSE 1) Without the stillness of your peace, without your presence that I seek, all thoughts I have, and say and do, are unfulfilled desires toward you. Without a grasp upon your robe, without a word to show me where I am to go, I tremble deep within my soul, anxiously running to and fro. Without the softness of your voice, this restless heart cannot rejoice. (CHORUS 1) More than words my heart does need, from your hand my soul must feed. Every moment filling me, with Your Spirit and Your peace. (VERSE 2) When my eyes don’t see the way, when my soul may feel you are so far away, I hunger more for who you are, Lord, draw me close and still my heart. Without the softness of your voice this restless heart cannot rejoice. (CHORUS 2) More than words my heart does need, from your hand my soul must feed. Every moment filling me, with Your Spirit and Your peace. When my eyes they cannot see, and you feel so far from me, I hunger more for who you are, draw me close and still my heart. (VERSE 3) I ask not that you take away, all the trials you would plan along my way. Be close to me is all I ask, reveal yourself along this path. ‘Cause with the softness of your voice this restless heart it can rejoice. With the softness of your voice this restless heart it can rejoice. "Trumpets Sound" is a proclamation of the promises of God through Jesus Christ that the righteous will overcome. As our enemies surround us, and we despair of life itself, the heart cry found in Psalms 7 – 9 echo our own cries of despair and weakness. But for those that put their trust in the Lord, they will look with assurance to the day of victory, where His purposes will prevail, trumpets will sound, and banners will raise to the Glory of God. (VERSE 1) Arise, Oh Lord, lift Yourself up. Awake for me, my enemies rage. The Lord my shield, my righteous judge, who saves the upright in heart. Oh Lord, you are strong in times of great trials, for those you know, who trust in your name. You’ve seen my affliction, be gracious to me, let my heart rejoice in your name. (CHORUS) Trumpets sound. Banners raise. We will sing to the Lord, how majestic your name. I proclaim my trust is in you. My King’s on His throne, you have made yourself known. Trumpets sound! (VERSE 2) Turn, O Lord, deliver my life. Save me for the sake of your love. Behold the wicked who plan to destroy me. Let their evil come to an end. Your light will break forth, the captives you’ll free. With shout of great triumph, your enemies flee. My cause you have taken, in righteousness judging. My King’s salvation is near! (BRIDGE) You have set your glory above. Out of infants and babes, you establish your strength. I’ll proclaim, with the angels I’ll sing, for I know the salvation my savior did bring. When I look on the work of your hands, I am humble before you, I’ll recount all you’ve done. Trumpets sound! (CHORUS 2) Trumpets sound. Banners raise. You uphold those who seek you, and deliver the weak. I proclaim my trust is in You. My King’s on His throne, you have made yourself known. Trumpets sound!